SUMMARY: A manual on how to spot, understand, and capitalize on the myriad resistance moments from our human clients. AUDIENCE: This book is aimed at dog training and canine behaviour therapy professionals, be they private or group instructors. REVIEW: I am a little biased reviewing this book as its author, Rise van Fleet, is one of my most valued professional contacts. Disclaimer time over: I can objectively recommend it as an absolute must-have for the professional. In “The human half…”, the author draws from her specialist knowledge in the human mind (PhD in psychology), as well as from her years of practice as a counsellor in both human family, and dog behaviour therapy. 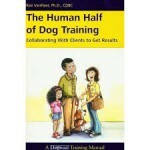 The book opens up with a chapter lamenting dog trainers’ frustrations towards non-compliance. If you’ve participated in a dog trainer seminar, conference or forum, you’ll know what I mean. Half our time and energy at these communal events is spent venting about our latest uncooperative client. Whilst the author recognizes the enormous challenges brought about by client resistance (less recommendations, dogs not getting better, cancelled appointments, etc.,) she empowers the readers into turning things around. The author encourages us to look at client resistance like we would a dog behaviour problem: identify the root cause. She suggests effective ways of tackling the usual rebels (e.g. the pack theory adept, the physical punishment type, the die-hard Cesar Milan fan,…) I am increasingly applying this to my practice, and am amazed at the results. Instead of dragging my “non-complier” into the program kicking and screaming (Aaaah, the silent saboteur. Aaaaah, the open rebel), I now get the whole family on board by candidly and respectfully addressing their objections. If I had to remember just one lesson from the whole book? People never resist in a vacuum. Find out why, respect their reason, and build on that. The author points out that we, the professionals, aren’t immune to the sort of biases we accuse our clients of. She encourages us to question these distorted thoughts as they pop up in our head, so as to defuse potential miscommunications. She runs through the classic set of cognitive distortions we all suffer from, giving rise to a ton and a half of ‘ha haaa!’ moments as you shift through the pages. The chapter on empathetic listening is jam-packed with trade secrets from this family therapy veteran. It boils down to letting the client feel like they are being listened to, whilst, yes, still getting the clinical information you need and still ending the session on time. You do this with a mix of tactful, but assertive, formulations; genuine respect and attention; focusing on the common grounds; and picking your moment. e.g. Is it ABSOLUTELY essential to correct the client’s use of terms like ‘dominance’ during the intake appointment? Can’t we just let things go smoothly there and gradually introduce the thing? Other tips that, in hindsight, should be painfully obvious to a science-based/force-free trainer: treat a client who has difficulty like you would a dog. Adjust your criteria to their level, mark the smallest improvement, don’t punish them for trying, gradually ‘proof’ their skills towards a more real-life setting, etc. So, why four and not stars – as I consider it a must-read? It’s a stupid reason, really, but there you have it. At least now I can’t be accused of being subjective. ; P Here goes: design. The layout and cover of the book don’t do it justice. If I didn’t know better, I’d assume it was self-published and I’d question the contents’ quality. I have the same problem with Nicolle Wilde’s wonderful books. I don’t know how economically realistic this is, but it would be interesting to see if investing big bucks in design for subsequent editions would attract a larger readership. So, in conclusion: I kid you not, reading the book has changed my life. I get more recommendations, more closed cases, and more satisfied customers by the day. I no longer see the human side of dog training as “either you have it or you ain’t.” I now hone my human skills like I do any other: read and practice, read and practice, read and practice. Browse the Book Review archive. Genre: professional manual. Author: Van Fleet Rise. Reading Level: Professional. Star: 4. Bookmark the permalink. Trackbacks are closed, but you can post a comment.